My name is Naomi Runder. I’m an organizer with Iowa Student Action and a student at Grinnell College. I never expected to be a student in Iowa. For a while, I wasn’t even sure whether I could be a student anywhere. As I was preparing to graduate high school in Nashville, Tennessee, it was hard for me to have certainty in completing a college education, knowing that I didn’t have any savings or family wealth. When I received a full-tuition scholarship, I knew I would follow wherever it took me: even if it meant moving from Nashville all the way to Grinnell. Going to school in Iowa has its perks – a major one is that the next president of the United States will more than likely come through my backyard multiple times over the next year. Just this weekend, I saw both Beto O’Rourke and Bernie Sanders in Central Iowa with my friend and fellow organizer at Grinnell College, Sara Castro. As two students who have struggled to find a college education we could actually afford, Sara and I were both eager to ask these candidates whether or not they support free college for all students, including the undocumented and those with criminal records, as well as living stipends for poor students, so they can afford housing and food. In coming to Iowa, O’Rourke and Sanders both say they want to listen to, and lift up, the issues that most deeply affect people across our state. Education is definitely one of them. As of November 2018, Iowa’s Board of Regents, the governing body for Iowa’s three public universities, has passed a policy known as the Multi-Year Tuition Model. The model will guarantee tuition increases of 3 to 5 percent every year for the next five years at both the University of Iowa and Iowa State University. In doing so, the Iowa Regents are placing a huge burden on the shoulders of already struggling students, and are essentially giving up on lobbying the state legislature for adequate education funding. Locally, Sara and I are working with Iowa Student Action on a campaign to reverse this model, and create an accessible flatline tuition model for Iowa students. However, this work needs to fit into a larger vision for equitable access to higher education nationwide. College students are in crisis, and adjustments around the edges of the existing tuition model are not enough to save us. We need to embrace education as a human right. O’Rourke and Sanders have both previously spoken about education as a priority. But accepting education as a human right means they will have to get more specific. 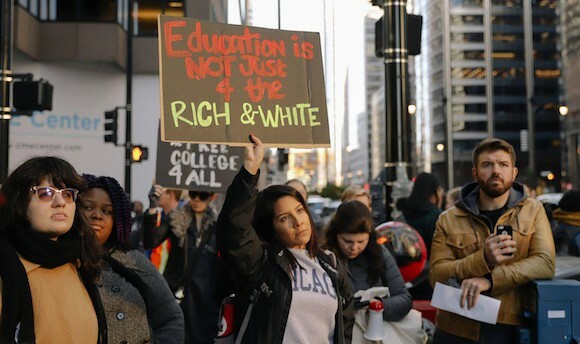 Free college for all includes free tuition at all public institutions, living stipends to support students’ basic needs, and guaranteed access to undocumented and formerly incarcerated students. We can’t leave anyone behind. So when I ask candidates about free higher education, I’m not seeking to create divisions or controversy. I’m fighting for my own survival. The uncertainty I felt about whether I would be able to get a college education is something I don’t want other young people to feel, but I know that many do. And once we’re here at school, we should not be struggling just to get by. If a presidential candidate wants my vote, and the votes of young people across this country just like me, then they are going to have to start presenting a serious vision of free college for all. I am looking forward to further conversations with O’Rourke, Sanders, and other candidates on what I believe this vision can look like as they return to Iowa. I’m dreaming big, and I think my next president should be too.